Chandler Marshall with some of her students in Japan. In preparation for a study abroad program in her senior year at San Diego State University, Chandler Marshall made a few visits to SDSU’s College of Extended Studies, through which the program is administered. 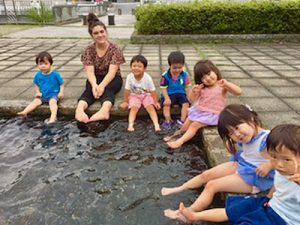 It’s there that she saw an American Language Institute flyer for Teaching English as a Second Language, which spoke to all her interests — her lifelong desire to teach, and her passion for travel and experiencing other cultures. Shortly after graduating with a B.A. in social science, Marshall enrolled in the TESL/TEFL certificate program, choosing the accelerated daytime schedule — four weeks of intensive study. “It was so fun and informational that the time actually went by very fast,” said Marshall. The 130-hour certificate program also has the option of 11 weeks of nighttime courses. “This program is one-of-a-kind and one of the best decisions I could have made after graduating from SDSU,” said Marshall. 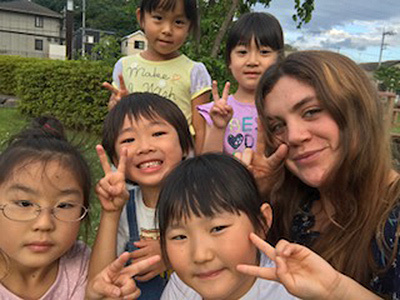 She answered a few questions about the program, and her experience teaching English in Japan. How did the TESL/TEFL program’s free worldwide job placement assistance work? The worldwide job placement assistance is one of the best benefits of the TESL program through the ALI. I never expected to get so much help and support from a program as I did from Allan [Pascua, program coordinator], Jason, and the rest of the professors. Allan and Jason do an amazing job of being available to help and guide you in the direction that is best suitable for you. Throughout the program, the instructors give you a ton of information on locations, cultural differences, salaries, and all else you would need to know prior to living and teaching abroad. After graduation, the directors and professors from the ALI are so helpful and supportive. I went into the office many times to meet with Allan and he would have brochures and contact information for jobs in the location I was interested in. Since I wanted to work in Japan, and Allan actually lived in Japan for many years, he had many recommendations. Not only that, but he would constantly check in to see how the job hunting was going and to offer more ideas. On top of that, they are able to write letters of recommendation when I was applying to jobs. They continue to frequently send other job offerings and information on events that are good to attend for future work. Snowy day fun in Japan! How soon after completing the program were you teaching English abroad? I completed the program in August 2016, and I moved to Japan in June 2017. I wanted to stay in San Diego for around a year after completing and take my time in the job hunt. What made you choose the country you chose? well as their country was very interesting and exciting to me. I knew from the start I wanted to teach in Asia. After doing the TESL program, it was solidified that I wanted to work in Japan. 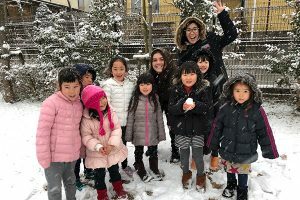 I met many incredible students from all over the world, but I really admired my Japanese students and all that they had to say about Japan as a whole. Utsunomiya, Tochigi, where Chandler Marshall lived while teaching abroad. I lived in the Tochigi Prefecture. The city I lived in was Utsunomiya, which is the capital of Tochigi. It’s a short 50-minute Shinkansen (bullet train) ride to Tokyo. I worked for a private school where Allan was good friends with the owner/boss. Two times a week I would have Baby Class (2–3 years old) from 9 am–12 pm. I would get to the school anywhere between 7:30/8 am to set up and prepare. Every day from 12–2pm I had a lunch break/time to lesson plan or prepare for classes. From 2:20–4:30 pm I taught my kindergarten class (5–6 year olds). From 4:30–6:30 pm I taught an elementary class (7–8 year olds). Once or twice a week I had an evening class until 7:30. These kids were ages 9–12 depending on the class or week. I worked at a small private school so the teachers I taught with were from America. In Utsunomiya, I met many expats/TESL instructors from all over the world. 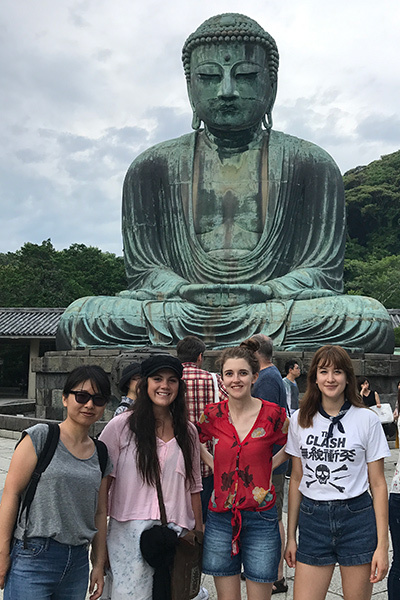 The Great Buddha (“Daibutsu”) of Kamakura is one of Japan’s most fascinating historical landmarks. Something that was amazing to me was the level of respect in Japan. For example, no one talks on their phone on the trains out of respect for others who may want to sleep or just simply want it quiet. Also going up and down escalators was so intriguing because everyone stays on the left side so that if people want to walk, they have plenty of room on the right side. Also ALL THE VENDING MACHINES WERE LIFE SAVERS! Haha. They have sodas, teas, coffees, espresso, flavored waters, and even hot drinks in vending machine all throughout the country. You can’t walk more than 100 meters without running into a vending machine. Which is great because anytime you’re thirsty or need some coffee, the drinks are super accessible. (They even have some with beer and alcohol.) I explored many parts of Japan as well as many other countries in Asia. 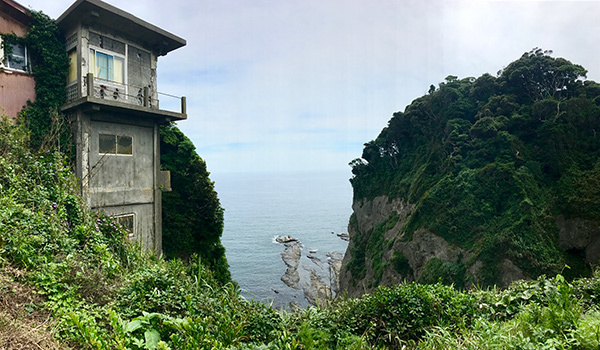 We had a good amount of time off, which made it very easy to travel and see what Japan and other countries in Asia had to offer. The food is absolutely amazing. Options are endless when it comes to food in Japan. Whether you want an amazing sit-down restaurant, to street food/street markets, they have it all. People in Japan truly take pride in their food and very rarely did I have a meal that I wasn’t completely impressed with. I made many lifelong friendships here in Japan. First off, I have a wonderful relationship with my boss and we plan to stay connected throughout the future. On top of that, the teachers I worked with were great and friends that I will have forever. Outside of work, I met many amazing people from all over. I have friends who are from Japan, and friends who are teaching here as well. It’s something really special to teach abroad and meet people you would never get to meet otherwise. These friends truly impact your experience and will be lifelong friends. How long were you abroad and what are you doing now? I was here in Utsunomiya for a year. Though I could have renewed my contract, I will be heading home because there are some big family events happening in the near future. 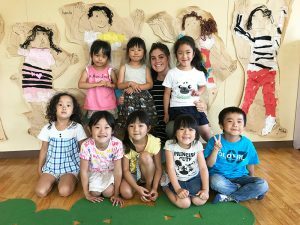 I am looking into other teaching jobs in Asia as well as Europe for the 2019 year. I know that I will return to Japan at some point in the near future and this country holds a special place in my heart. Marshall with summer school students. What do you think are the biggest strengths of the TESL/TEFL Certificate program at SDSU? I truly don’t think there is another program like the one at SDSU. It is so hands-on when it comes to observing and actually teaching in the classroom. On top of that, you have a new lesson daily on either English or how to teach English. You also present a lesson at the end of the week to show what you learned, and get constructive criticism to help for the future. It’s very unique compared to many certificates because it isn’t online and you get to practice in front of professionals and people who have been doing this for many years. Not only that, but post TESL certification, you receive so much support and help that can be very hard to do on your own. Which makes it so much easier to find the perfect job for yourself. This program is one-of-a-kind and one of the best decisions I could have made after graduating from SDSU.